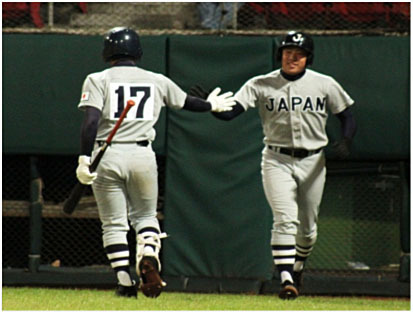 The Meiji Jingu Team, from Japan's Aomori Prefecture, edged out Taiwan's Kaohsiung County squad 8-7 in a 13-inning thriller (Tues. Dec. 27) to wrap up the final contest of the 2011 E.Sun Cup AAA International Baseball Tournament. Taking place in Hsinchuang Stadium of New Taipei City, Taiwan, the three-day series is billed as the "Showdown for the Top High School Baseball Title in Asia" - featuring AAA-level teams from Japan, South Korea, and Taiwan this year. Under the aegis of CTBA and sponsored by Taiwan's E.Sun Bank, the games also serve as player selection round for Taiwan's national squad in the upcoming IBAF AAA international competitions. In the concluding game between Meiji Jingu Team and Kaohsiung City on Tuesday, the exciting prolonged affair saw both sides going back-and-forth to level up the score four times during the extra-innings. Eventually in the bottom of the 13th frame, Meiji Jingu pushed one run across on a sacrifice fly to break the deadlock for the 8-7 victory. Earlier in the day (Dec. 27), the Korea High School All-Stars triumphed over Taiwan's Taoyuan County Team 4-1. The final day outcome had the Japanese, Korean, and Taiwan's Taoyuan County squads all ending up with the same two-wins and one-loss result. A tie-breaker rule had to be utilized (comparing fewest runs allowed between all the contests), and the local Taoyuan County Team was declared the winner of this year's E.Sun Cup. Japan's Meiji Jingu Team from Aomori Prefecture took 2nd place honours, and the Korea All-Stars had to content with the 3rd place finishing. Taiwan's Kaohsiung City Team ended up the bottom-place of the 4 squads, as they lost all three contests in this tourney. After presentation of the E.Sun Trophy in the closing ceremony, Mr. Lan Wen-Cheng, team manager for the titlist Taoyuan County spoke to the press. He said, "This is a gift from Heaven. I think God favoured us this time. We did not win the Cup outright with 3 wins, but had to rely on the tie-breaker on fewest runs allowed. This is not the best way to decide the title, but we will take it." MVP honor went to Lin Cheng-Hsien, pitcher for the titlist Taoyuan County, as he tossed a two-hitter complete game shutout (3-0 result) against Kaohsiung City in the second day. 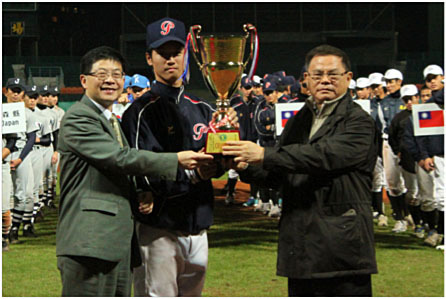 This is the 5th year for the E.Sun Cup AAA Baseball Tournament (started in 2007), with Taichung City winning the Cup in 2010, and Tainan City in 2009.